All of my piano students are gifted. I know this because their mothers tell me so! All kidding aside, while I adore each of my little “prodigies”, their giftedness is more often in the “gift of gab” category than the true definition of the word, with the exception of a small few. If you are blessed with a truly gifted piano student on your bench, keep a few things in mind when considering how to teach piano to your little Einstein. Check out our 8 tips below for teaching piano students who are above “the norm”. 1. Keep them challenged, but resist the urge to push – it’s tempting to “see what they can do”, but when you are dealing with a young, gifted piano student it is important to remember that their emotional development is often miles behind their mental abilities. Resist the urge to push them too hard both in terms of repertoire selections, but also when considering piano practice demands. Allow them to mature into their abilities while keeping them challenged enough to maintain their interest level. Work closely with their parents so that both parties are informed of how the child is not only progressing… but how the child is dealing with that progression. I am a very big proponent of letting children be children – regardless of their abilities or possible potential. 2. Establish yourself (quickly!) as the leader – gifted students often come with involved parents. You’ll find yourself in a frustrating tug-of-war if you don’t immediately become the clear leader of their child’s piano education. Parents will want to know that you have it “all together” and that you have a plan for their child’s piano education. I work best with all parents (of gifted students or not) by pre-anticipating what they want from me and giving it to them before they can ask. This is especially important with parents of gifted children. Be clear and concise with your expectations both for their child and for them. 4. Share the wealth – gifted piano students often benefit from the expertise of “guest” teachers. Give them the opportunity to participate in master classes with well-respected teachers either in your own community or beyond. Resist the urge to horde your student no matter how strong it may be! Another teacher’s approach may make what you’ve been telling them (repeatedly) “click” for your student. It takes a village to raise a well-educated, gifted student. Don’t be possessive. Be confident in your piano teaching; confident enough to allow your student to occasionally branch out. 5. Protect small hands – even if they have the mental ability to tackle ridiculously difficult repertoire, ensure you are not jeopardizing the “health” of their hands. Build muscle strength and coordination carefully and build up to their “mental level” gradually and with dogged determination. I watched a masterclass once where the piano teacher was icing his students’ hands and forearms after they performed (to ease the pain). I’ve never forgotten this image and I often wonder about the problems these children eventually endured with tendon and muscle strain. 6. Don’t build a house without a foundation – sure they may play Rachmaninoff in their sleep, but you still need to ensure their technical piano skills and theory knowledge are a central part of your instruction. Just because they can play it doesn’t mean they understand what they are playing. It’s your job to give them those skills. Without this knowledge they will hit a “ceiling” sooner or later. 7. Vary their repertoire – gifted students are usually inclined (or encouraged) to adhere to a classical-only diet. Variety is the spice of life – and it’s often a burn-out buster for gifted piano students. Even if they are not familiar with jazz, pop or improv, encourage them to be well-rounded musicians by exposing them to different styles and genres. Give them the opportunity to break free from rules and structure and just enjoy making music. Talent will take you far, but joy will take you farther. 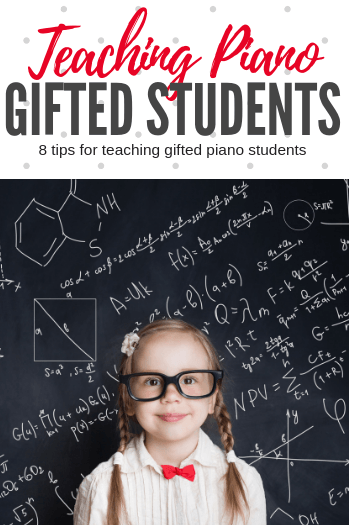 When examining how to teach piano to gifted students it’s important to think long-term. As their piano teacher, your number one priority should be to help them navigate through their “young prodigy” years while giving them the skills they need to mature into a great pianist for the long haul. But… it’s also important to really enjoy the thrill of teaching a gifted piano student – they are a rare and especially bright spot in your career as a piano teacher. Engage Them With Interesting Music! It’s easy to want to feed your gifted students a steady diet of standard classical repertoire, but keep them engaged with the pop sounds their ears crave! Our Beethoven Sessions, Chopin Sessions and Amadeus Anthems books are a great mix of classical pop piano solos that will have your students racing to their piano at home! Find them on Amazon.